Hosted and Cloud Telephony Solutions by West Pier. Learn about the hosted and cloud telephony advantages and the benefits over on-premise solutions. What is Hosted and Cloud Telephony? In short, moving your telephone system to the cloud or hosted platform means you move all or most of your telephony hardware and software (and the resources required to manage it) from your business site to a secure data centre. If you are considering moving your business telephone system and network to the cloud then you may know exactly what the advantages and benefits are over an on premise system. If you don`t however, it`s understandable, because `the cloud` is a buzz term that is thrown around a lot but is often not explained properly. What is the difference between a cloud telephony solution and a hosted telephony solution? A cloud telephony solution means all communication software and hardware is located off-site with nothing required on your laptop or in your office. A `hosted` communication solution is exactly the same as a cloud telephony solution with the addition that some extra software or hardware may be required (or optional) in your office or on your laptop to complement the advantages and features already offered by your solution. Cumulus is perfect for small to medium sized business with simpler requirements on a single site or multiple site deployment. Cumulus has advanced features without the premium price tag. Cirrus is our mid-range hosted telephony solution and provides the true feature set of an on-premise solution. i.e. not just SIP phones. Features Included full UC for IOS and Android as well as integration with ALL popular 3rd party applications i.e. MS Outlook and Sales Force. Stratus is our most flexible and feature rich hosted telephony solution. It provides the true feature set of an on-premise solution. i.e. not just SIP phones. Features Included full UC for IOS and Android and integration with ALL popular 3rd party applications i.e. MS Outlook and Sales Force. Customers with contact centre agents benefit from advanced multimedia functionality. What is the Advantage of a Cloud / Hosted Business Telephone System? The advantages of moving to a cloud and hosted telephony system are numerous. The typical burdens of onsite telephone systems which include maintenance, disaster recovery and storage space to name a few are passed on to your provider. Office space is freed up as servers and other hardware is hosed offsite by a 3rd party. Security, disaster recovery and phone maintenance is handled off site by external resources allowing for organisations to focus on other core business areas. Hosted and cloud based phone systems are highly scalable and therefore highly responsive to the growth or reduction of employees/extensions. The large start-up costs associated are eliminated as companies switch from a CAPEX to an OPEX model. Moving to the cloud reduces the energy bills incurred by hosting hardware on site. Call costs are reduced by switching from an ISDN connection to SIP. A move to cloud and hosted telephony allows for easier sharing of information between staff members across sites or on the move. A hosted and cloud based phone system can be set up to sync with your online systems as a reliable back up if your system goes down increasing business continuity. In summary hosted solutions have some advantages over on premises systems however in the long term the total cost of ownership can be much higher. 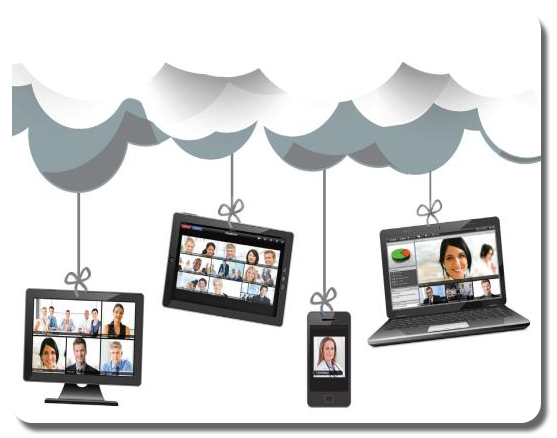 Please click here to view our cloud and hosted telephony Youtube video. If you are considering a hosted Avaya business telephone system then you have come to the right place. 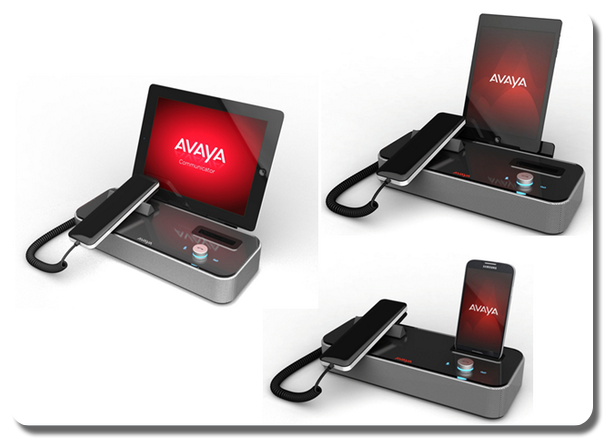 West Pier are a highly trusted Avaya partner and we have been working with the technology giant for over 20 years. There are currently only eight Avaya partners in the UK approved to sell hosted Avaya telephone systems directly to the UK market. West Pier is one of these partners due to our expertise, accreditation and close relationship with Avaya. All our engineers around the country are highly qualified with the latest Avaya accreditation and training. We take great pride in being an Avaya specialist and the trust Avaya have in our ability to deliver their Avaya IP Office and Aura Communication Manager in a hosted Avaya telephone system format, allowing us to regularly host events at Avaya's London city centre prestigious Tower 42 office in conjunction with Avaya, detailing our hosted Avaya telephone system solution, so you can be assured that we work very closely with them. Our hosted Avaya IP Office and Aura Communication Manager solution is based on a multi-Instance architecture which means you do not share the solution with anyone else and every feature within the solution is available for you to use. The solution is uncontended and unrestricted. Investment Protection. Where possible migrate your existing licenses and reduce your opex, re-use existing digital or VoIP handsets. Retain these assets if you decide to end your contract, avoid business disruption and change with improved continuity in user and customer experience. No feature limitations. Our multi-instance architecture differentiates us from the competition, you will receive every feature possible within the IP Office solution unlike most BroadSoft based solutions. Flexibility in deployment. The hosted Avaya IP Office solution can be adapted to your business requirements. Partial cloud or full cloud with flexible disaster recovery and deployment options such as working with older cabling technologies or local backup hardware onsite. CRM Integration. Stratus's multi-tenant architecture allows the solution to integrate with a much higher number of CRM systems and 3rd party application than most hosted telephony solutions on the market. Mobile working. Employees that are not on site can make or receive calls with their mobile phones, tablets and other portable devices regardless of location. Reduced Ownership Costs. Hosted Avaya IP Office phone systems are 20% cheaper to own and maintain than its competitors. Unified Communications. Separate data, voice, and video networks are bought together on to one easy to use platform. Contact Centre Features. Improved reporting and integration with Text, IM, Email, Voice or Social Media help improve contact centre customer service and agency efficiency. Scalability. The ability to easily add or remove extensions to reflect the size of a business is a useful feature of our Stratus cloud solution. West Pier offer both the Avaya IP Office and Avaya Aura Communication Manager communication solutions in a multi instance hosted Avaya telephone system format. Multi instance architecture uses one software application instance per client and has a range of benefits to it's users. Limited feature set - typically a high volume of tenants and subscriptions are required to compensate the large infrastructure investment in the platform resulting in the service being targeted at the 'basic user' market with simple or few telephony requirements resulting in a fixed and inflexible product. No feature limitations - every feature possible within the solution available for you to use and customise as required. The service is uncontended and unrestricted. Restricted deployment options - the result of a high volume and low or zero touch (i.e. self service) model to the customer means adapting your business to the product and it dictating deployment strategy for infrastructure such as cabling and disaster recovery in telephony. Flexibility in deployment - the solution can be adapted to your business requirements. Partial cloud or full cloud with flexible disaster recovery and deployment options such as working with older cabling technologies or local backup hardware onsite. Existing Avaya customer? Existing Avaya customer? Rip and replace - telephones cannot be re-used and software does not have the potential to be migrated, no continuity of user experience, re-training required. Investment Protection - where possible migrate your existing licenses and reduce your opex, re-use existing digital or VoIP handsets. Retain these assets if you decide to end your contract. Have a level of continuity in user and customer experience. West Pier offers LG-Ericsson iPECS telephony solutions in a multi instance hosted format. Multi instance architecture uses one software application instance per client and has a range of benefits to it's users. Why choose iPECS as your hosted telephony solution? What is iPECS Cloud? Why would it suit my business? What benefits will it deliver? 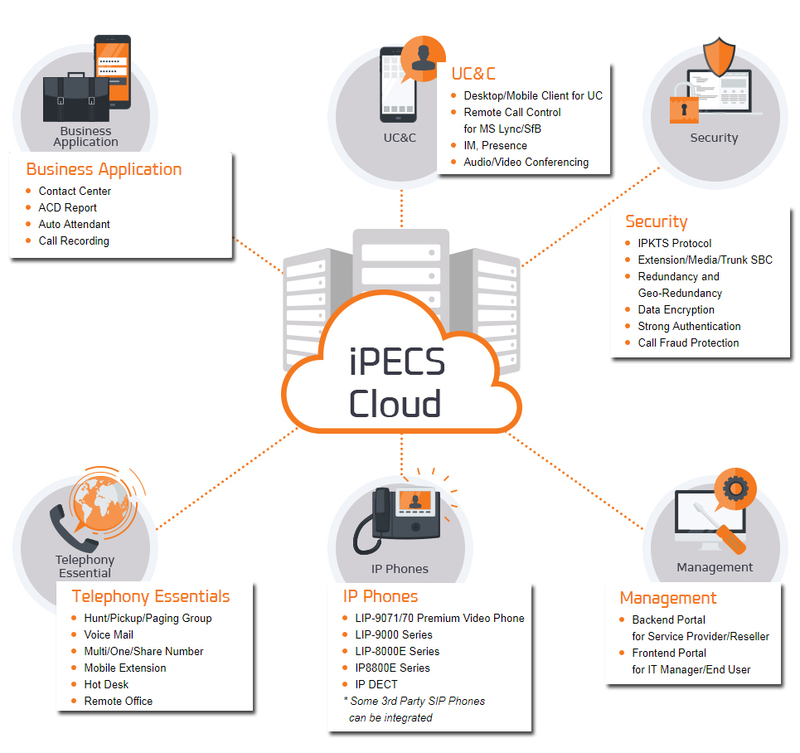 iPECS Cloud brings all of the features you know and love from an on-premise phone system and delivers them through the cloud. iPECS Cloud is tailored to deliver reliable and simple communications to your desktop from our highly secure and resilient data centres. This means we manage the phone system for you and you just use the handset, web portal or applications to access everything you need, when you need it. Because iPECS Cloud is designed to scale it suits all sizes of business whether you are have a single home office or multiple locations around the globe. With on-demand features and same-day provisioning you can add users or remove users quickly and easily. With our advanced feature packs you can completely tailor the user's experience and provide a call centre solution, reception console and much more with a simple click. iPECS Cloud brings your teams together with simple tools for collaboration and communication. On-demand access to features and the ability to add or remove users means you have the flexibility to adapt to your business needs. With fully featured handsets and simple web, PC or smartphone interfaces your users will understand the benefits of iPECS Cloud in record time. If you would like to discuss our cloud and hosted telephony solutions or have any questions please call us on 0344 264 5522 or please email us.